Ahmad Anwar Zainuddin under the supervision of Professor Anis Nurashikin Nordin working at Department of Electrical and Computer Engineering of International Islamic University Malaysia have compared the resonance frequency measurements of quartz crystals using openQCM and impedance - network analyzer. The comparison show a good agreement between openQCM and the standard scientific instruments. After an email exchange between our team, talking about how to modify the original openQCM design for their specific applications, the researchers have sent their preliminary results. When I asked to Anwar and professor Nordin the permission to publish their measurements, the team said: "We agree to publish the measurement results to the openQCM community. We're happy if our results can help other researchers around the world." The researchers have made test verification of the resonance frequency measurement using commercial quartz crystal resonators at 16 MHz and custom designed quartz crystal sensors. 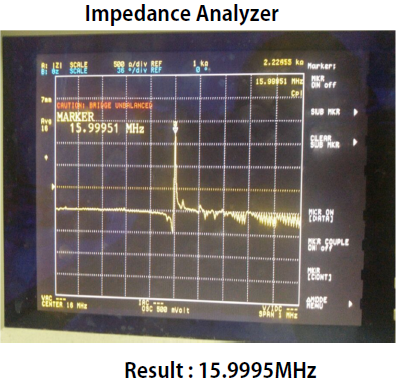 They have used impedance and network analyzer to measure the actual frequency results. 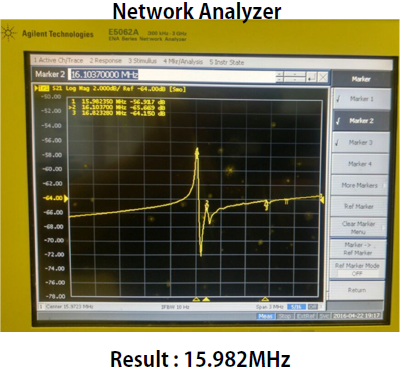 As shown in the pictures, the results show a good agreement between openQCM and network - impedance analyzer for standard quartz crystal resonators at 16 MHz. I'd like to spend some words about the 16 MHz quartz crystal sensors working with openQCM. Arduino Micro controller has the microprocessor ATMega32U4 with a clock speed at 16 MHz. The frequency of the vibrating quartz crystal is measured by using the FreqCount algorithm developed by Paul Stoffregen at PJRC, which uses the processor clock "to count" the number of pulses during a fixed time interval. The nominal frequency of the quartz crystal is very near to the clock of the Arduino Micro, for this reason openQCM frequency measurement shows greater fluctuoations around the nominal frequency. The researchers are working on an intriguing custom designed QCM Quartz Crystal Microbalance. The devices are placed on a single quartz plate and there are a total of 6 resonators. Each resonator can be addressed independently to either the openQCM or network analyzer. 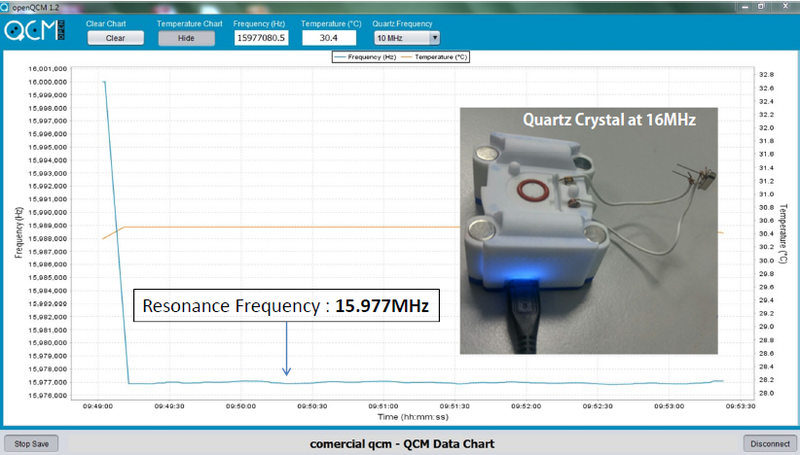 Here the results of openQCM and network analyzer using custom designed quartz crystal sensors at 14 MHz, for two different sensors of the array (D5, D6). 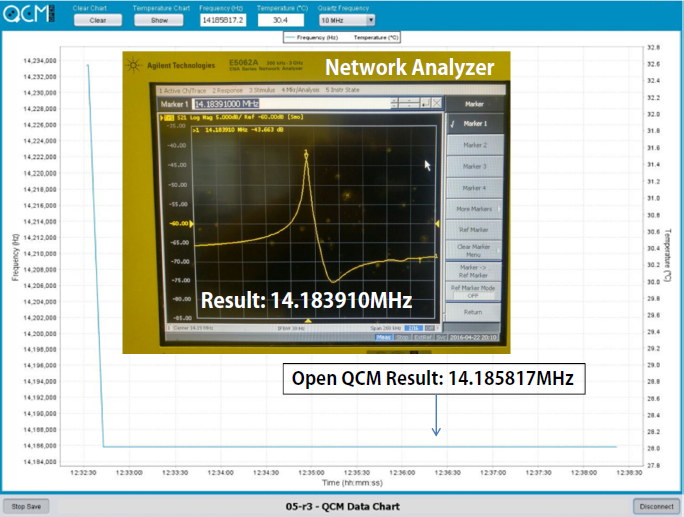 Again, the experimantal results show a good agreement between openQCM and network analyzer for custom quartz crystal resonators at 14 MHz. I'd like to share my ideas about the very interesting quartz sensors design developed by the researchers. The 6 resonators placed on the same single quartz plate is a really intriguing setup. 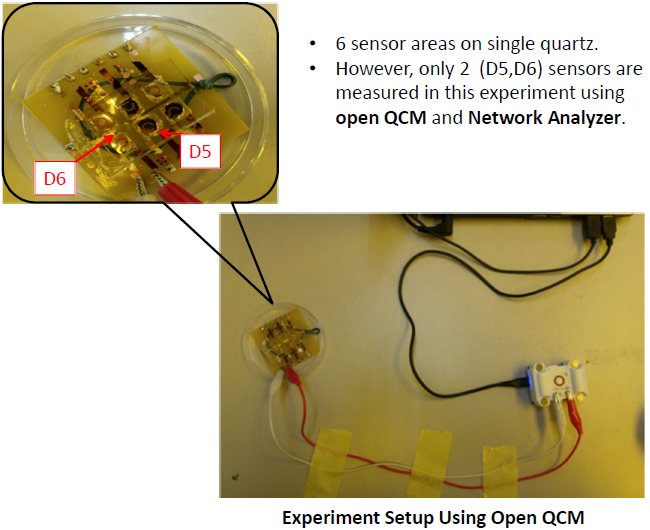 In my opinion, one of the most relevant feature of this setup is the QCM temperature vs frequency dependency, which can be drastically and simply reduced by comparing - mixing the signal coming from at least two different quartz crystal sensors: one is the "reference" and the other is the "sensor". 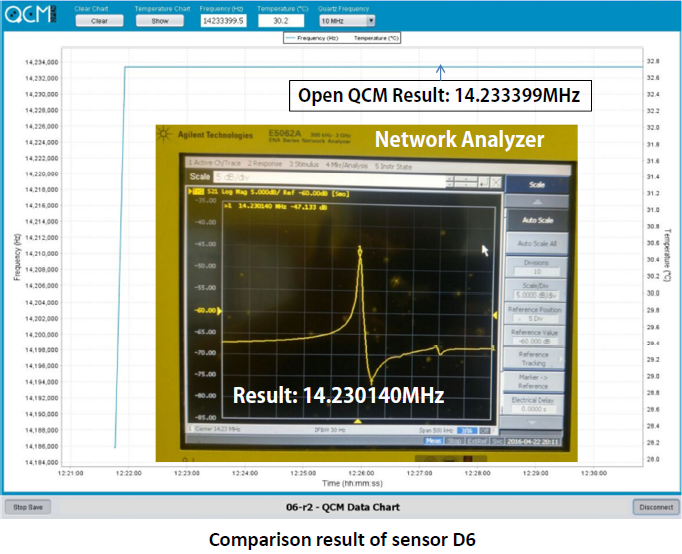 Here the summary of the results and comparison gained by the researchers during the verification test openQCM vs impedance - network analyzer. In conclusion, the table of comparison of resonance frequency for this experiment shows a good agreement between OpenQCM and Network Impedance Analyzer results. The results are very promising and the openQCM team can't wait to know more about the future works of the researchers. Professor Nordin said: "Anwar is trying to perfect the design of the quartz sensors for his PhD. We'll give you more details once he's perfected the fabrication process. Anwar is working very hard to get his devices working well as sensors. We'll keep you updated with our progress". openQCM would like to give a great thanks to Professor Anis Nurashikin Nordin and PhD candidate Ahmad Anwar Zainuddin for sharing both their experimental results and knowledge with the openQCM community.